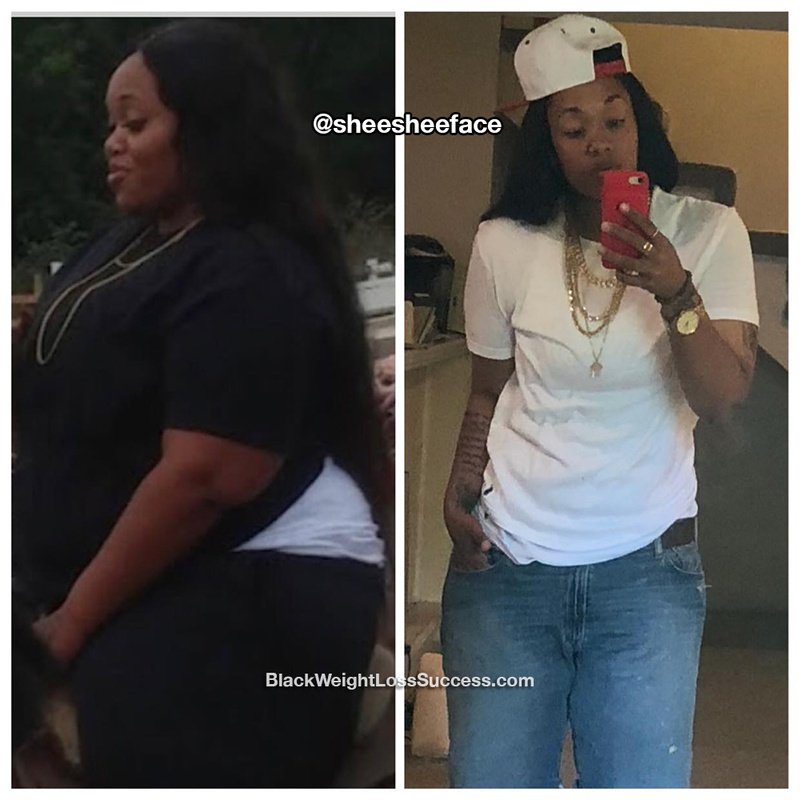 Transformation of the Day: Sheena lost 142 pounds. 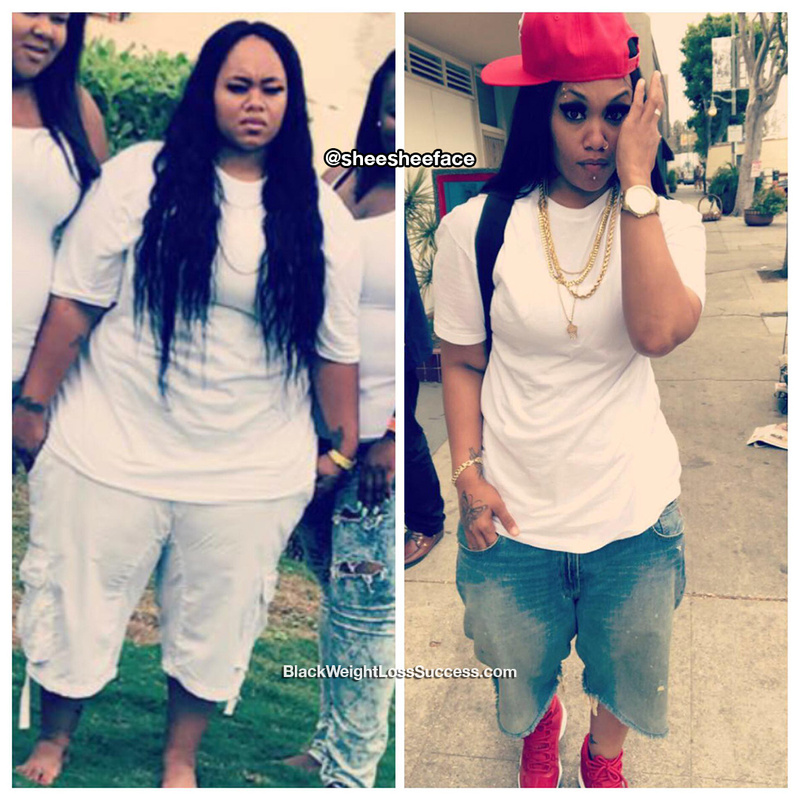 She was diagnosed pre-diabetic and borderline for high blood pressure, both weight-related diseases. Her doctor sent her to a specialist who prescribed a drug to combat cravings and hunger. That became her magic pill, combined with healthy eating habits and exercise. Check out her journey. I started my journey in January 2017. 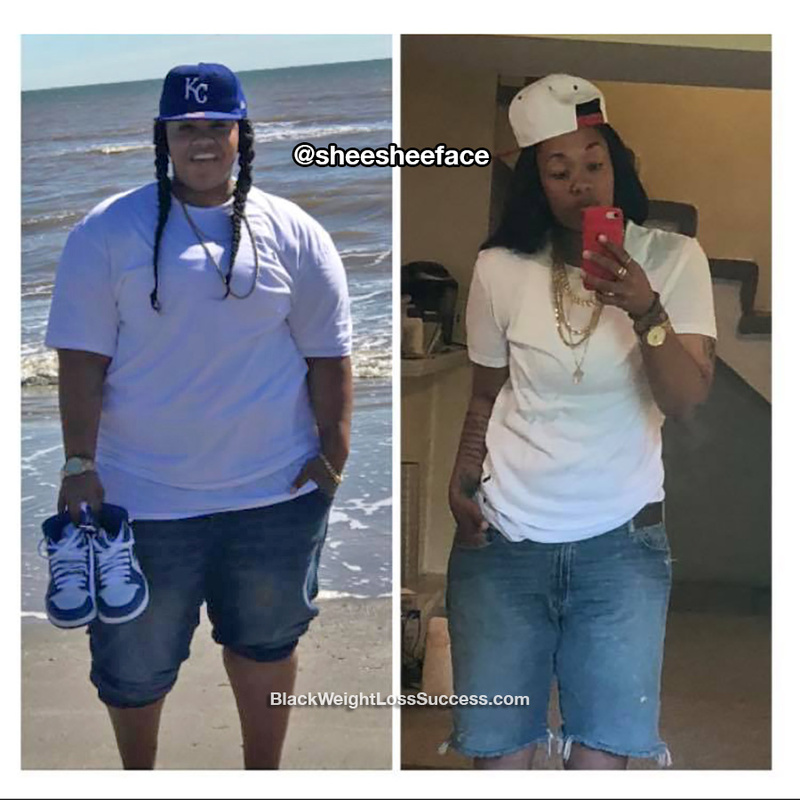 I weighed 356 pounds when I started my journey, and now I weigh 214 pounds (height: 5’7″). When I went to the doctor in December 2016, he told me that I was pre-diabetic and I had borderline high blood pressure. He also said that it was all weight related. Next, he sent me to a weight loss specialist. The first thing I asked this new doctor for was weight loss surgery, but he said that I was too young. Instead, he wanted to put me on a pill first. He prescribed me a drug called Qsymia and this pill has been the magic pill for me. It takes away the sugar cravings and curbs your appetite. I lost my first 100 pounds in the first 6 months. I was also working out twice a week with a trainer. Here I am, almost a year and a half later, still keeping the weight off. The doctor wants me to lose about 20 more pounds and then he will start transitioning me off the medication. I’m no longer pre-diabetic and my blood pressure is normal. Hopefully, my story will help others. Qsymia worked wonders for me. What inspired me to keep going when I wanted to give up was the thought of dying because of of obesity. Again, high blood pressure and being pre-diabetic are both weight related. I was too young for any of that. I stopped eating bread and pasta. I still ate a serving of rice or potatoes once a day, but I left the bread and pasta alone. I also stayed away from fried foods, soda, candy and chips. I cut out red meat and pork as well. I only eat chicken, fish and turkey. The biggest lessons I’ve learned are that this is a lifestyle and that consistency is the key. Making healthy choices daily helps me stay on track. When I think of this as something I want to do for the rest of my life and not just something I’m doing until I’m get to the size I want to be, it helps me to keep going… and never get comfortable. It never gets easy, but it’s a lifestyle. What advice would you share with other women who want to lose weight? I want to tell all women who are struggling with their weight to Never Give Up! If you have bad one day, start over the next day! Keep pushing and Keep moving! Disclaimer: Reference or link to any specific product, drug, diet plan, exercise plan or service mentioned in the weight loss stories we share is for the information of our readers, and does not constitute an endorsement or recommendation by Black Women Losing Weight. Very proud of you and you are my inspiration…. You and the many other women truly inspire me while I’m on my weight loss journey…it’s been very difficult for me but seeing real life results such as yours gives me hope…. Congrats Ms. Sheena. Continue to inspire. Reading your story have truly saved my life.I will talk with my medical provider about the weight loss presription. God bless and thank you again!